Dog Lagotto Romagnolo and a cat for friend. Dog Lagotto Romagnolo and a cat for friend.Dog and Cat get along almost always. If they are both puppies, everything will be simpler. Their coexistence is anyway possible. The dog is a predator. The cat is territorial. That is the main obstacle to overcome. Two specimens properly socialized, it really makes no sense to give up the affection of a dog because we have a cat, and of course the other way around. In the literature there are many explanations on how to introduce an adult dog in a family where there are one or more cats, and also how to insert a cat when we have dogs. We will focus on the arrival of a puppy of Lagotto Romagnolo when there are already cats in the family. This competes us. Our puppies are followed at all times of their growth to be dogs loved by their families and have all the requirements, created with socialization, to have a cat for friend. The Lagotto is a dog that for character, nature and intelligence has all the requirements to get accepted and not pose a danger to the cat. The predatory instinct of the dog should move the cat attack if he considers him as his prey. In the selection the Lagotto Romagnolo has almost completely lost that instinct. Awaken the predatory instinct in a socialized lagotto, when he is a puppy, in the home environment will not be easy. Almost impossible if we proceed with the necessary attentions. When the puppy grows we should ask to our pets the respect of the hierarchies. With a lagotto it will be really hard to have to go that far! For each dog the respect of the hierarchical scale and therefore of the person always comes before any unlikely predatory instinct. The Lagotto Romagnolo in particular for temperament and character has no difficulty in living with other animals, and the cats too. If we attended and managed in the right way the first meetings between the two family furry friends everything will go fast for the best. The cat could pose a danger to the puppy. The reason why a cat might not accept a puppy is always and exclusively traced back to the territory. Considering that in the house the food will always be plentiful for both. Only space sharing can trigger conflicts. The cat is a free spirit e haven’t many hierarchies in his hand. His first thought will be: “When I come back to my territory I do not want you little lagotto around me, it’s clear!.” If for a moment we can think like our cat, we will identify easily which is his territory. It is important to avoid macroscopic errors. 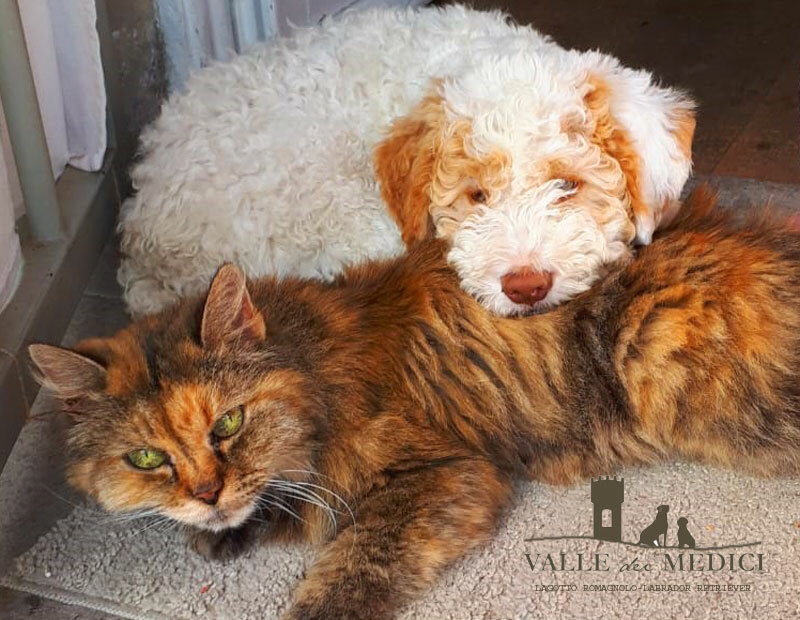 The clashes are very dangerous for the puppy of Lagotto..
Our Lagotto puppies have not received an imprinting such as to consider the cat an enemy. Probably not even the cat treats the puppy as an enemy. As usual you have to proceed by degrees. The arrival of lagotto puppy we will continue to give the same attentions to the cat, as usually. Slowly we have to get them to the idea there are both. Let them see from afar, feel the reciprocal smells transported by our clothes, it serves to make the right associations. We must not be in a hurry to make them known. When possible, it is useful for the first meeting to take place in neutral territory. Out of the house. In our presence they can eat at the same time. Two bowls well apart but that make the idea of coexistence. Evaluate the reactions of both to increase the duration of the contact periods. Both in the same room or in the garden. Considering that the puppy of Lagotto will have to acclimatate to the new house and to the new people too, it is good really good idea proceed with the utmost caution and without any haste. The moment of “they lived happily ever after”will come. Definitely!